All right, everybody, welcome. We are here today to officially kick off the promotion for a fight that’s going to take place at The Theater at Madison Square Garden on Saturday, November 25. That’s the Saturday after Thanksgiving. Sergey “Krusher” Kovalev is going to fight Vyacheslav Shabranskyy in a fight that is going to be a little departure for what Sergey’s gone through lately. It’s going to be a fight where both guys stand in the ring and throw punches at each other. I think it’s going to be entertaining and fun for all. We’re thrilled to be bringing Sergey to the Mecca of Boxing for the very first time. It’s something we’ve been wanting to do for a while and I want to thank Joel Fischer, Sal Federico and, of course, Larry [Torres] of Madison Square Garden, who is here with us today. It is the number one destination for boxing in the country as far as I’m concerned and we’re really looking forward to putting on a tremendous show. Sergey, of course, the former unified light heavyweight world champion, with a 30-2-1 record, with 26 knockouts; he’s anxious to get back to his “krushing” ways. It’s been over two years since he’s fought on regular HBO in the United States. It is time to get back on track and based on what we’ve heard this morning, apparently, he’s the man in the light heavyweight division again! Sergey said he was going to retire Ward; I guess he did. He’s going to be fighting Vyacheslav “Lion Heart” Shabranskyy, 19-1, with 16 knockouts and he is the current WBC USNBC Light Heavyweight Champion. This bout is scheduled to be a 10-round light heavyweight matchup and it will be in the Theater live on HBO Boxing After Dark® beginning at 10:00 PM, Eastern and Pacific. At this moment, tickets have already gone on sale. Our presale was very good and you can still get them at ticketmaster.com and the MSG box office. They start at $50 and range up to $350 for ringside, so this is a very nicely priced event. I think it’s going to be terrific. We’re going to have lots of other fighters on the undercard, you’ll hear more about them in the coming weeks, but we’ve got a lot of guys who will be from New York who are just starting out with Main Events, some others who’ve been with us for a while. Every fight, as a usual, Jolene puts together the best undercards in boxing, as far as I’m concerned, and I’m sure she won’t let us down because she never does. It is my pleasure to introduce my friend Ray Stallone, HBO Vice President of Media Relations. Ray Stallone: Thank you. Not too many comments but I just want to obviously say thank you to our host here today, the Renaissance. This is a really, really nice venue. This is so bright, so airy, so classy, it is just lovely. The next time someone asks for recommendation where we should go in New York, this would certainly be considered. The second thing is there’s always a formula in boxing where you feel like something special could happen. I feel like we have something special perhaps on November 25th. You’ve got promotional firms like Main Events and Golden Boy. You’ve got Madison Square Garden as the venue, HBO Sports as the television company, those add up to a formula where we really could see something special on the night of November 25th. The other element that makes that night interesting people say, “Gee, Thanksgiving weekend, people are busy.” HBO has traditionally found that that Saturday night is a really solid sports entertainment evening for viewership. Maybe it’s because people are traveling Wednesday and Thursday, maybe because by Friday they want to settle in on Saturday night and just stay home and watch live sporting events. It is actually a terrific sports viewing night. So, anyone who’s thinking, “Oh gee, it’s going to get buried on Thanksgiving weekend with family celebrations,” there’s a window for some real live sports entertainment and we think we’re going to hit it. The other thing I wanted to mention is, on behalf of Peter Nelson, Tony Walker and Jonathan Galst and the rest of the HBO family, we do have a tripleheader, this Saturday night on HBO at 10:00. Many of our people and executives are on the West Coast today, but as I mentioned to Sergey, they will certainly be back in New York and at the final press conference. All of our executives will be back and we want to welcome Slava to the HBO broadcast. He has been on HBO Latino, I believe, twice now. He’s actually familiar to the HBO subscriber family, with the HBO Latino platform, but this will be his debut on HBO Boxing After Dark®. Last comment I wanted to make: I was doing a little bit of research, if that’s the right word, and I think everyone, especially fight fans and boxing media, love it when fighters fight frequently. This fight on November 25th will mark the 10th time that Sergey has fought since January of 2014. This will also be on November 25th, Shabranskyy”s 10th fight since January of 2015. So, that kind of frequency, I think is ideal for boxing fans to connect with these fighters. And obviously, from a television perspective, the more they’re on TV, the more you can showcase them. We’re pumped up for November 25th. We will see you then. KD: Thank you so much, Ray. Again, I can only just echo what Ray had to say about bringing together Main Events, Golden Boy, Madison Square Garden and HBO. These are the crown jewels of the sport. I think that it’s wonderful to know that after– my company is coming up on its 40th anniversary, and most of that time we’ve spent– we’ve been working with HBO, and it’s always a pleasure. I can’t tell you how important it is to us to be able to do that. Now, I’m going to bring up an old friend. Long, long ago Rolando Arellano was the manager of Fernando Vargas. As part of that journey on HBO, he must have fought, I don’t you know how many times? Rolando Arellano: Many, many times. I think since he was 19 years old. KD: Yes. And Vargas had a spectacular career there. And Rolando, as I said, was half the fun, really, of working with Fernando. And it’s wonderful to have him back here today, now that he is the executive in charge of fighter relations for Golden Boy Promotions, and I’m going to bring him up to introduce Slava Shabranskyy and tell us all about what he expects to have happen. RA: Actually, my boxing birth, was given over at Main Events, and I’ve learned so much from Kathy, and from Patrick English, from Jolene, and many of the other staff members. But, good afternoon, my name is Rolando Arellano on behalf of Oscar De La Hoya’s Golden Boy Promotions and all the staff members, it’s a great pleasure to be here. We thank all of you for joining us today. It’s also an absolute pleasure to be working with my dear friends again over at Main Events, of course, HBO, and the one and only Madison Square Garden. As we all know in the recent years, there has been a complete portfolio of Eastern European boxers that have taken boxing by storm. Golden Boy now has a pleasure to represent one of these boxers by the name of Slava Shabranskyy. He’s actually from the Ukraine. Slava has a record of 19-1, with 16 by way of knockout, he is currently the WBC USNBC Light Heavyweight Champion. It is my pleasure ladies and gentlemen, at this point in time, to introduce a champ, Slava Shabranskyy. Vyacheslav Shabranskyy: Good afternoon, it’s a great pleasure to be at New York. I’m excited to be fighting at Madison Square Garden and on HBO. 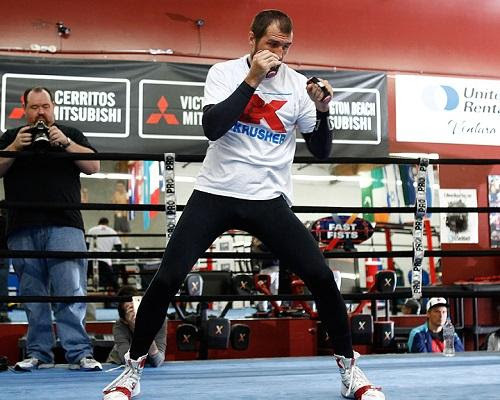 I’m excited to be fighting a great ex-world champion Sergey Kovalev. I look forward to bring the best in me for this fight is the only thing. Thank you, see you November 25th. KD: I want to make a point of saying that, we worked really hard to find someone who was willing to fight Sergey Kovalev; it’s not easy. A lot of people didn’t want to even take our call, a lot of people didn’t even ask, how much? They just weren’t available. But when we called Golden Boy, we had an answer in about an hour and that speaks to the professionalism of the people over at Golden Boy. It also speaks to the professionalism of this gentleman to my side, Mr. Shabranskyy. This is the way boxing is supposed to be. Fighters are supposed to want to fight each other and it’s refreshing when it happens and, generally, those turn out to be the best fights. Now I am going to introduce to you Sergey’s manager, and also my friend, Mr. Egis Klimas. Egis Klimas: Good afternoon everybody. I am very happy to be back here in New York City and Madison Square Garden. In Sergey’s career, he has never fought here in New York, so is very excited. We have a lot of fans. A lot of people that when he fights somewhere else like Las Vegas or Los Angeles, many people are coming from New York to see him. Now we’re going to be able to bring Sergey’s fights to New York, so we’re going to have a lot of fans. There are a lot of Ukrainian fans here in New York, so hopefully Madison Square Garden Theater is going to be sold out. We would like to thank HBO for giving us this opportunity. Especially thanks to my fighter Sergey Kovalev for coming back after all those nonsense things. I believe he is clear-headed completely. I would say completely clear-minded coming for the next fight. As far as Slava, I have known Slava for some time. He was coming to my gym sparring with– actually never sparred Sergey, but he was sparring with some other of my fighters. The one thing he has for sure is his nickname “Lion Heart”; he has a heart. So, I know that fight is going to be really good fight for both of the guys, and I just wanted to wish good luck to both of them. KD: Thank you, Egis. A man who I’ve had the pleasure of introducing many, many times, he is the former unified light heavyweight champ of the world and I think he’s going to be that again, sooner than perhaps we thought, and this is the next step in the road to achieve that goal, and so here he is, Sergey Kovalev. Sergey Kovalev: Hi, everybody, we’re happy to be here in New York for first time. My fight coming up November 25th and really happy to fight in East Coast again. I’ve fought in New Jersey, Atlantic City, but never fought in New York. I want to say thanks to my team, promoter Kathy Duva and my manager, Egis Klimas, and HBO. Also, to Team Slava Shabranskyy. Personally, to Slava Shabranskyy, that he approved to fight me November 25th. I will back stronger than I was before. It’s my goal right now to prove everybody and for myself that I am still strong fighter and I can be world champion again.That I have two last losses, it’s just like a huge lesson for me. Not like for the boxer, just in my life. I made a lot of analysis from these losses and I hope I will be much stronger than I was before. Thank you very much for your support and see you in November. Thank you, very much. KD: Thank you Sergey. One little plug I want to put in. We have a nice little show coming up on October 5th at the Mohegan Sun. It’s another Main Events’ Mohegan Sun’s Rising Stars show. If you can make it out, you should come. It’s a beautiful card with Vaughn Alexander fighting Elvin Ayala in the main event. It’s going to be tremendous. Question: Tim Dalberg from AP would like to know your reaction to the announcement of Andre Ward’s retirement. SK: If it’s 100% true, it’s good for the boxing. It’s good for the boxing. We’re ready for fighting again for these titles and makes interesting fights between great fighters. Right now, in our division, a lot of good and strong fighters who wants to get this title. This would be very, very good fight for the boxing fans. Question: Do you think his retirement is real or it’s for publicity? SK: I don’t know. I don’t think about him at all. Because I’m looking forward to get my goals. That was my last two fights, it is already history. I forgot about those. Questions: Are you disappointed of the possibility that you would not get a third fight? SK: Yes and no. If this fight can happen very quickly, I’m happy. If like long time waiting, just to fighting close to titles, it’s no good. I want to be best in this division. I wanted to fight with the best fighters in this division. Question: Do you have an update on your trainer search? SK: I’m not looking for a coach. Just like everything counts as camps. Just have patient. My team will be complete in my training camp and in the ring also. Question: When do you begin training? Question: Do you go to Big Bear first like you normally do? SK: It depends from the weather. From the weather in Big Bear. Question: I would like to know if you find the timing of Andre Ward’s retirement strange. Is he trying to upstage you? SK: His team and his self can’t play, he’s like mentally the games as they did before rematch. I don’t know, I don’t care at all. Question: You said that you are starting next week at Big Bear. Is there a possibility that you work with Abel Sanchez? Question: Supposedly Andre Ward left those titles vacant. Of course, everybody is looking towards vacant titles. If you don’t reach that goal, would you go after Superman Stevenson? SK: I’m ready fighting anybody, but my goal to fight for the title as soon as possible. But right now, my fight is against Slava Shabranskyy and I have a focus on this fight. After this fight, will be understanding for me next way. Question: Virgil Hunter had reached out, I think, and you kind of humored the idea of having him as your trainer if Andre was to move to cruiserweight or retire. Is that still a possibility to have Virgil Hunter be your new trainer? SK: I thought about it, but didn’t decide it. I still thinking, but is good offer maybe, or maybe not. Who knows? I can’t get back to team of my opponent who I hate. Right now, two persons inside me like wrestling yes or no. It’s not easy to say yes or no. Just I keep going myself right now. I already almost understand who will be in my team. But I not ready announce it, because I’m not sure 100% ready they or not. But I already decided who I want to see in my training camp, in my team. Question: Sergey, will this match-up with Shabranskyy determine if you stay at light heavyweight or move up to cruiserweight after this match-up? SK: Cruiserweight very good because you can eat more in your diet. I understand now that I’m small for cruiserweight. Guys are losing weight from over 200 pounds and in the fight, they can have a weight like 210, 215 and more pounds. I am 185 to 190 maximum, it’s difficult to make 175 for one day; after this I get weight back and I feel good. I think so no.Maybe in future will try but not right now. SK: Thank you very much. KD: All right, thank you, everyone. Thank you for your time and we’ll see you in November 25th and I hope October 5th. About Kovalev-Shabranskyy: The Saturday, November 25 bout between Sergey “Krusher” Kovalev and Vyacheslav Shabranskyy is a 10-round light heavyweight match-up at the Theater at Madison Square Garden in New York City. The event is promoted by Main Events and Krusher Promotions in association with Golden Boy Promotions and will be televised live on HBO Boxing After Dark beginning at 10:00 p.m. ET/PT. Tickets range from $50 to $350 and are available at ticketmaster.com and the Madison Square Garden Box Office. 7 Bombshell Boxing Retirements Nobody Was Ready For!